If your idea of fitness is learning how to deliver an effective kick to the groin, try Krav Maga. Before you read on, a word of caution—this article contains fistfighting, groin-kicking, arm-twisting and shoving. It might sound like an action sequence from a Quentin Tarantino flick, but it’s not—it’s a regular class of Krav Maga. And it’s rough stuff. A world away from jazzercise. “Krav Maga (Hebrew for ‘contact combat’) is a battle-tested Israeli system of self-defence,” says Vicky Kapoor, Regional Director, Krav Maga, India. It was first developed by Imi Lichtenfield, an Israeli soldier in the 1930s.” Tall and imposing at 43, Kapoor could pass for a gun-wielding General himself, when I meet him at his studio in South Extension, New Delhi. He was introduced to Krav Maga in 2003, when he was looking to further expand his knowledge of martial arts, and has been hooked since. Trained in Israel, by senior instructors like Eyal Yanilov and Avi Moyal, he now conducts classes for civilians, military and law enforcement units in the city. And the numbers are growing. “From working women and call centre employees to politicians and school-going kids, I train them all,” he claims. “It’s considered one of the most practical and effective techniques for combat and self-defence. Hundreds of law enforcement agencies and celebrities practise it the world over.” There’s no doubting the popularity of Krav Maga—Jennifer Lopez, Angelina Jolie and Sandra Bullock are known to have practised it, and closer home, it has patrons like Bipasha Basu, Priyanka Chopra and Omar Abdullah. But is what’s right for a young Israeli soldier, practical for the civilians? “An attacker or a potential threat would not differentiate between a soldier and you. Why should your training be any different?” says Kapoor. “As instructors, we’re equipping students with a battle-tested martial art form of tactical manoeuvres, so that they walk in peace.” Hold on. Did he just say martial art? Isn’t that more of an eastern thing? Like kung fu or karate? And don’t they all claim to offer the same benefits and moves? “The essential meaning of ‘martial’ is warlike,” says Kapoor. “Traditional martial art forms have moves adapted from animals, but Krav Maga works on identifying and improving natural human reflexes. 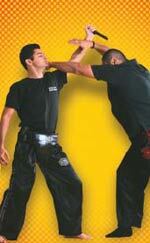 Most martial art forms are not realistic self-defence systems. Their fancy and ritual-oriented moves would not hold up against those thugs on the street.” Kapoor would know. Prior to joining IKMF (the International Krav Maga Federation), he trained exhaustively in Judo, Aikido and Taekwondo, and at present heads about 12 martial arts federations in India. With so much emphasis on self-defence, and defensive tactics, it appears that it’s just about fighting all the way. The classes prove otherwise. Kapoor’s class starts with basic warm-up exercises like rotations and squats, to lubricate the joints. Then comes a fastpaced, high-energy workout, designed to tone and strengthen your body. According to estimates, an hour of Krav Maga can burn 800 calories. There’s boxing, punching and striking to some very loud music. To the outsider, it looks dangerous and exhausting, but Kapoor assures that the classes are relatively safe and injury-free. Physical benefits aside, there’s an emphasis on mental agility. Using dummy guns and other props, students are familiarised with different assault scenarios. Each student has a padded “attacker” for a partner, who abuses them physically and verbally. The attacker allows the students to practise powerful, closecontact defence techniques. Decisionmaking under high-pressure situations is also taught in these workshops. Krav Maga is far from pretty. It’s dangerous and painful, with occasional bruises thrown in. But it also means greater flexibility, mental agility and getting trained for some of life’s battles, which might stand you in good stead one day.